Defence Day is celebrated in Pakistan as a national day on 6 September in memory of how Pakistan defended itself and Indian army called cease fire in the Indo-Pakistani war of 1965. Pakistani celebrate defence day almost every part of country yesterday. Pakistan Army held exhibition of war weapons in many cities of Pakistan and Pakistan Air Force also held parade session in Islamabad. After long time the people of Karachi also celebrate the national defence day after the successful operation by Pakistan Rangers. 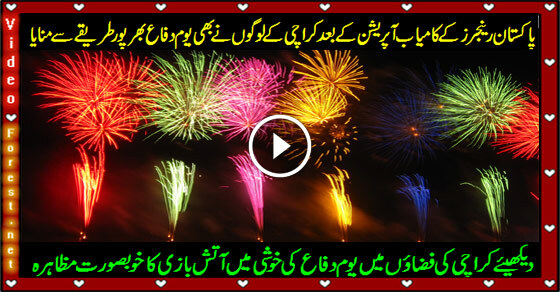 In this video you can see the amazing fireworks by people of Karachi on defence day.